On Friday, July 13, 2012, presumptive GOP presidential nominee Mitt Romney sat down for interviews with all five networks following several days of heightened criticisms over his time at the private equity firm Bain Capital. Romney defended his work there to CBS News chief political correspondent Jan Crawford, and said the president owes him an apology for his campaign's "reckless and absurd" accusations. Below is a transcript of the full interview. Video clips are also available at CBSNews.com. JAN CRAWFORD: Governor Romney, the Obama campaign is saying that you either committed a felony by lying to the SEC or you are lying to the American people about when you left Bain capital. What do you say to that? GOV. MITT ROMNEY: Well, I think this kind of statement from the Obama team is really shocking, it's, it's ridiculous, and it's beneath the dignity of the presidency. Look we just had a report come out that millions of Americans remain unemployed. We have 8.2 percent unemployment. That's the 41st straight month we're above eight percent and the president's campaign comes out with these ridiculous charges that obviously every fact checker that looked at it has said it's absurd. And yet they keep on pushing it. I simply - I simply think the president has to recognize that this should be a campaign about the direction of the country, and these personal attacks have to stop. CRAWFORD: But you say it's ridiculous. But why is there this discrepancy? You said you left Bain in 1999 yet Bain is listing you as CEO up until 2002, so why were you listed as CEO until 2002? GOV. ROMNEY: The documents show that there's a difference between ownership, which is I owned shares in Bain, but I did not manage Bain. I left as everyone knows to go out and run the Olympics in February of 1999. I was full-time running the Olympics. I had no role whatsoever in the management of Bain after I went off to the Olympics. And that's been demonstrated by people who work at Bain, by all of the documents, but I still retained an ownership interest, I had the capacity if I were not on leave, if I were actually wanting to run the business to do so, but I did not. I left. And that's been demonstrated time and time again. CRAWFORD: Even if you weren't making these daily managerial decisions, though, doesn't the buck stop with you? GOV. ROMNEY: Actually when you leave an enterprise, when you have other people who are managing the enterprise, who take responsibility for all the investment decisions, who decide who's going to get hired and fired, who decide compensation decisions, they're the managers, they're the people running the business. I left the business and went off to run the Olympics, did that full time and after three years, when the Olympics were over, we arranged my departure officially from a retirement standpoint. CRAWFORD: If I could then talk about before you left in 1999, Bain did invest in a series of companies that did expand overseas, sometimes at the expense of American workers -- are you responsible for those decisions? GOV. ROMNEY: Well I'm not sure which ones you're talking about, but I can tell you the people who have looked at the charges that the Obama campaign comes out with, which is that somehow we outsourced jobs, they've said that those were false and misleading. That the ads are inaccurate. Some have given it multiple Pinocchios. The president keeps on trying to divert any attention he can from his failure to turn around the American economy, and that's what this campaign's about. But the president keeps on trying to find something about Bain which is simply not true. And I left Bain in February of 1999. People can point out how - I was in Salt Lake City for three straight years. I don't recall even coming back once to go to a Bain or management meeting. We were, I was out there running the Olympics and it was a full time job, I can tell you that. CRAWFORD: So not once. You don't remember a board meeting, you don't remember talking about whether or not there should be outsourcing jobs overseas? Do you remember any involvement with Bain Capital from 1999 on? GOV. ROMNEY: Jan I had no involvement with the management of Bain Capital after February of 1999. If I had, I would have brought that up at other places where it would have been beneficial to me. But look, I left Bain in February of 1999 as everyone knows I went out and ran the Olympic games. It was a fulltime job. I'm happy that Bain went on, on its own, and did a number of terrific things. Built a very large enterprise, larger than when I left it. But you know the truth is I left in February of 1999 as has been demonstrated time and time again. I was an owner, and being a shareholder doesn't mean that you're running the business. The people who are running it are the ones who run it today and by the way they've been on the air. A number of them are Obama supporters, by the way, actually one fellow who ran for U.S. Senate in Massachusetts, a Democrat, is a Bain Partner. He's been on the air saying the same thing. Mitt left in February of 1999, had no involvement whatsoever with management beyond that point. CRAWFORD: But as an owner, would you have made money off some of the decisions after you left that were made by other people? GOV. ROMNEY: Well as an investor, all of the investors participate in the success or failure of various investments, just like you do as a shareholder of an enterprise. But you're not managing that enterprise if you're a shareholder. If you're a shareholder in Ford Motor Company, for instance, you don't make the decision as to where they're going to build a facility or how many people they're going to hire. Those are decisions that are made by management. CRAWFORD: But you were the sole owner? I mean, how should we be thinking about this? What was your role? You were the sole owner until 2002? GOV. ROMNEY: I was the owner of a, of the general partnership but there were investors which included pension funds and various entities of all kinds that owned the, if you will, the investments of the firm. But I was the owner of an entity which was a management entity. That entity was one which I had ownership of until the time of the retirement program was put in place. But I had no responsibility whatsoever after February of '99 for the management or ownership - management, rather, of Bain Capital. And by the way, this is really the height of silliness. Don't you really think so? We've got people, 23 million people that are out of work or stopped looking for work, need jobs, and the Obama campaign is out there month after month talking about one attack after the other on me. How about talking about the president's failure to get this economy going? How about talking about a vision for who can get America working again and can see rising wages for the American people? But what he wants to do is try and divert any attention from his lack of success and frankly it's beneath the dignity of his office. He ought to apologize for what he's doing and do what he said when he called me. When I cinched the nomination he called and said you know we're going to have an important and meaningful discussion about the future of the country. Isn't it time to do that? Instead of engage in these ridiculous attacks? CRAWFORD: But I mean do you think the President owes you an apology because his campaign has suggested you are a criminal or a liar? GOV. ROMNEY: Absolutely. My goodness. What kind of a president would have a campaign that says something like that about the nominee of another party? This is reckless and absurd on his part and it's something which is beneath his dignity. I hope he recognizes that. Even fellow Democrats have said that. This, look, the president needs to talk about the direction he'd take the country and stop these kinds of ads and attacks that are so, disparate from what the American people want to talk about. CRAWFORD: But you'd like for him to apologize? GOV. ROMNEY: Jan, I've told you all I've got to say about that. I think that the president has demeaned the leadership which he should be bringing to this country. CRAWFORD: Well let me ask you this then, because obviously this is something that we've been hearing a lot about from the, the Obama campaign, the Obama campaign officials and even the President himself suggesting that your time at Bain perhaps, you're going to be painted with the same brush as a lot of people on Wall Street and you know the American people don't hold some of those people in high regard on Wall Street. Are you worried people will think you're hiding something, are you worried about kind of this perceived lack of transparency? GOV. ROMNEY: Well you know the lack of transparency that I think we saw from the White House in the last couple of weeks has really been quite disturbing, where the president exercised executive privilege to say that documents associated with the Fast and Furious program are not going to be provided to Congress. Talk about a lack of transparency. And then of course there was this promise during the campaign that matters related to health care would be discussed in the open and would be seen on CNN and on cables. That didn't happen. The President has not shown the kind of transparency in leading the country that is necessary. With regards to my own transparency, I've disclosed all the information required by law. Also provided income tax returns which are not required by law and if anyone wants to know what I did in 1999, they can just look at the papers in Salt Lake City and they can see I was running the Olympic games. I think people know that. And so these kinds of attacks are just not only ridiculous, but so far beneath the dignity of the president's responsibility and leadership that I think people have to shake their head and wonder why won't this man focus on getting Americans to work and getting incomes rising in America again? CRAWFORD: Governor you mentioned the tax returns. You've released one year of your tax returns. A lot of people are saying you should release more, you've got to go back to the early 1980s for a Republican - or a presidential candidate who has only released one year of tax returns. Are you going to be releasing more tax returns? GOV. ROMNEY: Yes, I'll be releasing this year's tax returns as soon as they're available. And uh - But I know, by the way, you can never satisfy the opposition research team of the Obama organization. They'll always want more. And the answer is they'll have this year's and last year's and that's the information that, by the way, is not required by law. It's the same type of information that was provided by Senator McCain and his campaign. It gives people a full review of my income and my expenses and that kind of matter. I'll tell ya, it's quite a process running for president. You obviously provide all the information you can about yourself and then you have all the opposition team say some pretty outrageous things which I think are very, very disappointing on their part. CRAWFORD: Let me ask you one final question Governor about the Olympics, which you know well. Obviously have a lot of people have been very upset this week to learn that our uniforms were manufactured in China and now an American company has come forward to say that they will make them here before the Olympics, do you think the Olympics committee should take them up on that? GOV. ROMNEY: You know, I don't know the particulars or the circumstance, so I really can't comment on that. I presume they have sponsors that are associated with uniforms, and matters of that nature, so I'm not going to weigh into the decisions made in that regard. CRAWFORD: Do you think the uniforms should have been made from the outset in America? Should that have been a priority or does it trouble you that our uniforms, for our US Olympic team were made in China? GOV. 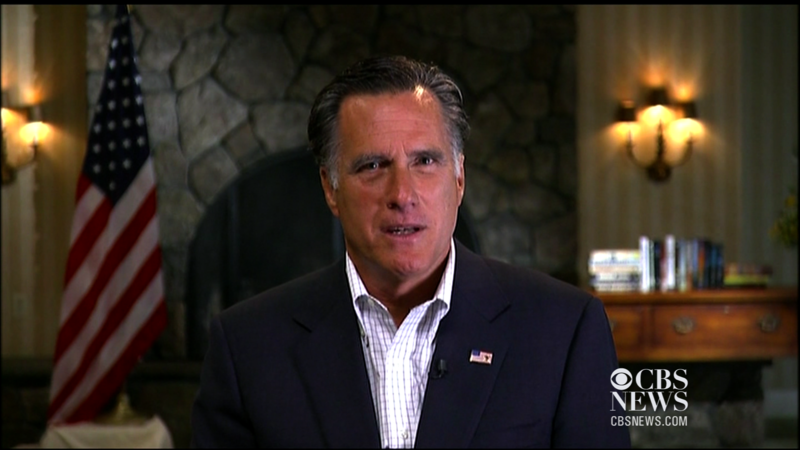 ROMNEY: I think I really responded to that already, I don't have any further comment that what I've already said.